Keep your floors safe from flying sparks and embers while adding beauty to your fireplace. 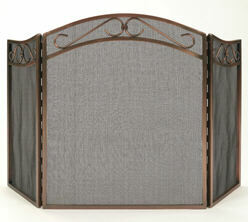 Woodfield 3-panel, Rubbed-oil Bronze Fireplace Screen. Please note: Item's actual weight is 16.5 lbs. However this item ships UPS Oversize due to carton dimensions.